Taken together, our family ministries—Kids Ministry, Younger Students Ministry, and Student Ministry—represent one of the most significant focuses of our church, which is to see every child and student that comes through our doors grow in knowing, loving, and living for Jesus. We've seen God stir new life in Christ in several kids and students this year, and witnessed too many other evidences of God's grace to mention in these ministries over the course of this year. 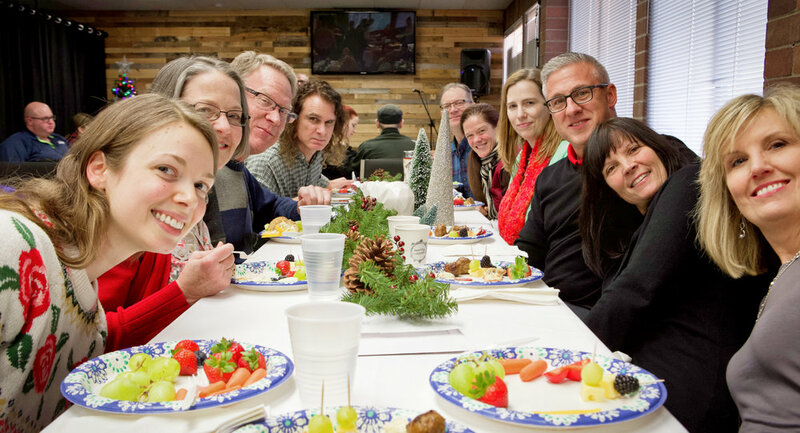 This past Sunday afternoon we got to celebrate all this gospel fruit by hosting a Christmas party for all the super faithful volunteers that God has used to invest in the lives of these kids and students. We enjoyed a great time of food and fellowship together, shared tons of stories of the gospel fruit we've seen in these ministries over the past year, and had a pretty competitive white elephant gift exchange as well! Join us this week in celebration and thanksgiving for all the ways God is growing the kids and students of Sound City through these ministries. Join us also in praying that God would continue to protect, encourage, and bless our leaders, and that he would continue raising up more leaders for these important ministries in the year to come. Sound City Students in grades 6–12, come join us this Wednesday, December 13th, from 6:45pm–8:30pm at the church offices as we celebrate Jesus’ birthday together at our Student Ministry Christmas Party! Invite a friend and bring along a pack or two of white socks with you for our annual "sock snowball" fight. After having an amazing "snowball" fight, we'll take time to pray for those in need in our communities who will be receiving these socks. Finally, we're also looking for volunteers to help provide food for the Student Christmas party. This Sunday, we'll be in week three of our Advent with Friends sermon series, where we're studying the traditional Advent themes of: hope, peace, love, and joy. This Sunday Pastor Seth Winterhalter, from Harbor Church in Olympia will be joining us and teaching from God's Word on the Advent topic of Love, out of the Book of 1 Peter. Come join us this Sunday, and in the mean time, read more about our Advent with Friends series, by clicking on the image above. This Sunday marks the due date for the return of all Giving Tree ornaments and gift cards, so don't forget to bring yours back this Sunday, December 17. For an update on how we're doing so far in responding to this year's Giving Tree opportunities, see the video below. You—the Sound City Bible Church family—have been always been a generous bunch, and through your giving God has allowed us to help those in need within the church family, to support the various ministries of the church, to support new church plants and church planters, and so much more. So, first and foremost, thank you for partnering with us in the gospel work God continues to give us to do. Relatedly, we also wanted to take this opportunity to provide you with easy access to our new giving portal on our website, since it's common for folks to have more questions than usual about giving as we near the end of the year. The link you can always use to access our giving portal is: scbc.do/give. Just click on that link, at left (or the button below), and you'll find information about several different ways you can take care of your year-end giving. If you have other questions about giving that aren't answered on our giving page, please email Michael Eller at: michael@soundcitybiblechurch.com. P.S. We're also looking forward to offering you an even easier way to give, access our sermon library, keep up to date with all the latest church news, and more, all via our new mobile app—which should be ready and available to us very soon. We'll keep you posted! As we move ever closer to Christmas and our celebration of the birth of Jesus, we wanted to make sure you had all the information you need for your holiday calendaring. This year is a little different for us, since Christmas Eve itself falls on a Sunday. So instead of the evening services that we usually do on Christmas Eve evening, this year we'll be hosting three morning services on Christmas Eve day, at: 8:00am, 9:45am, and 11:30am. Kids Ministry will be available in all three services for kiddos age four and under only, with the older kids joining in the main services with their parents. So mark your calendars now for Christmas Eve morning, and join us as we celebrate the birth of our Lord together. Oh, also, for those who can, please try and attend the early or late service if aren't planning to bring guests along, so that we've got plenty of room at the 9:45 service for all those who might be coming for the first time. For most people in our culture, New Year’s Eve is a time of celebration, partying, and looking forward to the future. For Christians, we always have good reason to celebrate, because we have a resurrected Savior. This year, we are doing something special for our two morning services on December 31: an extended time of singing, worship, and prayer. We’ll have lots of Scripture readings, times of prayer, a celebration of the Lord’s Table, yet no formal sermon. Join us at either 9am or 11am on New Year’s Eve day for this special time of worship and praise! If you're not currently part of a Community Group, come join us Sunday, January 7, for the 2018 kickoff of our Connect Group, from 3pm–5pm at the church offices in Lynnwood (4720 200th Street SW, Suite 200, Lynnwood, WA 98036). The Connect Group is our temporary-by-design Community Group that has as its primary goal: helping all who come to find the best possible long-term Community Group fit. It’s also a place to where you’ll meet new people, learn about biblical community, and experience it as well. Go to scbc.do/connectgroup for more information or to sign up to attend (and register for childcare) use the button below. In keeping with our Advent series themes, here's a few video resources from our friends at the Bible Project, to reinforce the biblical truths we've covered thus far in our Advent with Friends sermon series.